What sea creature spends its life on its head, attached to a rock, a log, or a whale by a large cement gland, waiting for the right moment to sweep its feathery feet through the water in hopes of catching a few morsels of food? A barnacle, of course! Whether you knew it or not, you've seen barnacles at the beach - small, white, miniature volcano-like blobs stuck to the rocks, looking about as interesting as paint drying. What you see is essentially the barnacle's house, a set of four to six interlocking calcium carbonate plates with a small hatch door on the top. The barnacle is a shrimp-like creature living inside the volcano-house. At low tide, the barnacle house closes up tight to keep moisture inside, but at high tide, the doors open and out come the barnacle's cirri (feathery feet) which are specially adapted with tufts and hairs to filter the water (like a comb, like the baleen of a whale) to catch small particles of food, which get swept right into the house and to the barnacle's mouth. Barnacles are crustaceans - a division of animals belonging to a larger group called arthropods. The arthropods (meaning jointed feet), which include insects and spiders as well as the mostly marine crustaceans, are characterized by their jointed limbs and their rigid exoskeletons (skeletons on the outside of their bodies). These exoskeletons are made of chitin, a long-chained carbohydrate derived from glucose. This tough biological substance is rivaled only by the protein keratin, which human hair and fingernails and whale baleen are made of. Crustaceans include crabs, lobster, shrimp, copepods, and krill. Some are parasitic, such as sea lice, but only one group of crustaceans is sessile (non-swimming) and spends its adult life on its head - the barnacle. After fertilization, barnacles start out life as small free-swimming larvae called nauplii (singular 'nauplius'), a tiny one- eyed creature consisting of just a head and a tail - no stomach, therefore no feeding. After some days at sea as a wandering victim of currents (and predators), the nauplius undergoes up to six metamorphoses until it transforms into a cyprid larva, a more complex creature with antennae and a big 'ole cement gland smack dab on its back. The sole fixation of the cyprid is to find a place to settle. With its growing exoskeleton, the heavy cyprid sinks out of the water column, then 'crawls' along the substrate using its antenna to 'smell out' a good location to settle. Once this location has been found, the cement gland pumps out a protein that is stronger than the strongest Krazy Glue (so it will be no surprise to you to learn that dentists are researching the chemical nature of this protein to replicate it for dental adhesives). Interestingly, the scars of adult barnacles long dead and gone are like the Chanel No. 5 of the underwater barnacle world - they attract cyprid larvae which preferentially attach to these scars. It makes sense - if it was a good home for someone else before your time, it's likely to be a good home again. (It's the ultimate squatting!) Within hours of attaching, the cyprid undergoes its final transformation into a juvenile barnacle, which begins to extract calcium carbonate from the seawater to build the calcium carbonate plated houses that we are so familiar with. But the story's not over! As the barnacle grows inside its calcium carbonate home, two things must happen in order for it to expand in size. First, the barnacle has to shed its exoskeleton and moult into a new, larger, skin. These tiny barnacle exoskeletons sometimes litter the tidepools or wash up on the sandy beach, looking like teeny tiny dead shrimp (10 could fit on your pinky fingernail). But as the barnacle grows inside its shell home, those interlocking calcium carbonate plates must also expand and grow. As clusters of barnacles on a rock do this, sometimes an individual will squeeze out its neighbour - slowly lifting it up off the rock until it pops off and floats away (and does not survive!). So, next time you look at a cluster of barnacles with their doors all closed up tight, you'll know that a lot more is going on than meets the eye. But wait! You may think that now the story is over, you know how barnacles select a home, how they eat, how they grow - but ask yourself this, "If you are a sessile barnacle, how do you make those fertilized eggs in the first place?" There are no fancy rituals to attract a mate, no complex pheromones, and no flashy skin colour changes for these guys and gals. Instead, each barnacle has to make do with the neighbours it has around it... and barnacles have developed some interesting ways to handle this. First, they are hermaphroditic - yup, they're both boys and girls! 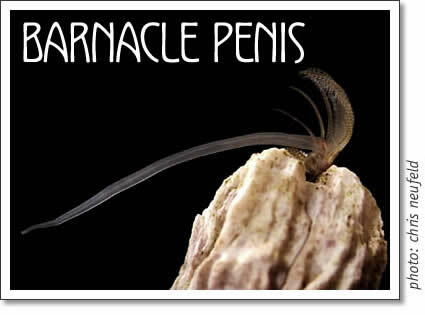 Second, barnacles have the longest penises in the animal kingdom (relative to their body size)! But they don't actually self-fertilize, they just dip in to their neighbours' houses while everyone is busy eating. Hmmm. 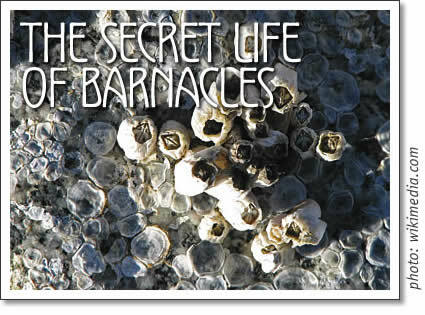 So, with those last facts, you now know almost all there is worth knowing about barnacles. Get out to beach on the next rising tide and watch what happens when the water comes in! Josie Osborne is a marine biologist and Executive Director of the Raincoast Education Society. Reach her at 250.725-2560 or email res@island.net. Tofino naturalist Josie Osborne from the Raincoast Education Society in Tofino on the biology of barnacles.